Plantains are a staple of Latin American and Caribbean cuisine, but tend to be confined to ethnic grocery stores farther afield. Tough and fibrous when raw, plantains release their sweetness and yield a soft, almost fluffy texture after baking. Although plantains are from the banana family, they are rarely eaten raw and are less sweet but more starchy than their cousins. Unlike bananas, plantains can also be green when ripe and typically take a week or so to turn black. When baking savory dishes with plantains, choose ripe, plump fruits that are yellow overall but are starting to turn black; avoid those that are bruised. For sweeter dishes, select very ripe specimens with black skin. Green plantains, although ripe, are best kept for baking chips, as they crisp up easily and won’t stick to the baking tray. Because the texture is sticky, use a mandoline for slicing the plantain into thin chips. Plantains may look like bananas, but the fibrous skin doesn’t peel away with the same ease. To prepare them for baking, trim off the ends and score along the length of the plantain’s skin with a paring knife; then, pull the skin sideways away from the center rather than drawing it lengthways. Beware of the milky juice that seeps from the skin, as it stains clothing and leaves a gummy, hard-to-remove residue on work surfaces and cookware. Plantains can be cooked in their skin, with just a thin slit to retain moisture, but wrapping them in a single layer of aluminum foil is also an option. Avoid leaving them out of their skin and exposed as they harden and discolor rapidly. Plantains have a neutral, rather bland flavor when raw, but baking them in the oven gives them a soft texture that readily absorbs butter, salt, sugar and cinnamon flavors, for example. For a sweet dessert dish, baste the plantain in a mixture of melted butter, rum and brown sugar; wrap in foil; and bake for 20 minutes at 350 degrees Fahrenheit. Then, baste again, turn and bake for an additional 15 minutes. For a savory dish with a Caribbean flavor, place the plantains still in their skin on a baking tray and bake in an oven preheated to 375 F for 30 to 40 minutes. Remove the tray from the oven and allow the plantains to cool slightly before drizzling them with a mixture of lime juice, melted butter, chili flakes and salt. Return them to the oven for 10 more minutes to seal in the flavors. For crisp, baked chips, use green plantains, which are firmer than the riper versions. Peel the plantains completely and slice the fruit into thin chips, roughly 1/8 inch thick, with a mandoline. Toss the slices in oil, sea salt and chili powder. Arrange the chips on a baking sheet, one layer thick and not overlapping, and bake for 20 minutes on a high heat, around 425 F, flipping the chips halfway through the time. Remove the tray from the oven and allow the chips to rest for 5 minutes. The color should be golden and the surface slightly singed. 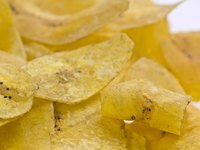 Eat plantain chips quickly as they tend to soften after just a few minutes. A bowl of hot plantain chips can either be dressed with ketchup or dipped in sour cream, ranch sauce or even spicy black beans. Food Republic: What’s the Difference Between Plantains and Bananas?